With an extremely choice location, very close to midtown, this 19-story building, which was erected as a cooperative in 1963 and has only 30 apartments, is one of the more elegant apartment buildings of its era as its avenue frontage is clad almost entirely in limestone. It has a stringcourse above the first floor that is at the same level as that of the adjoining very fine Italian Renaissance-palazzo style apartment house at 810 Fifth Avenue that was designed by J. E. R. Carpenter. The design of 812 Fifth Avenue by Robert L. Bien also pays some contextual homage to the other building by creating terraces in the middle of its facade that begin at the same level as the lower of two stringcourses at the top of 810 Fifth Avenue. The terraced design is handsome and symmetrical and culminates in a large watertank enclosure with a large grill. This building replaced three townhouses on the site. "The new apartment house was more dignified than most of its contemporaries," Robert A. M. Stern, Thomas Mellins and David Fishman noted in their book, "New York 1960, Architecture And Urbanism Between The Second World War And The Bicentennial," (The Monacelli Press, 1995). "Above the thirteenth floor symmetrically arrayed setbacks created a ‘tower’ partially clad in the glazed white brick what was becoming such a ubiquitous feature of the Upper East Side," the authors wrote. 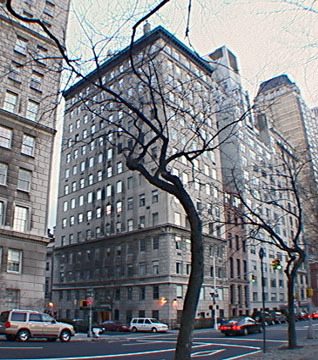 In discussing the adjoining building at 810 Fifth Avenue in his excellent book, "Luxury Apartment Houses of Manhattan, An Illustrated History," (Dover Publications, Inc., 1992), Andrew Alpern notes that that building’s original sales brochure discussed the convenience of nearby subway stations, a few blocks away. "Perhaps the combination of bucolic and urban amenities led Nelson Rockefeller to create a triplex penthouse in the building for his first wife, Mary Todhunter Clark, and himself. It was here that he raised his first family, and it was this apartment he most considered home, despite houses in Westchester County’s Pocantico Hills and in Venezuela. He liked it so much, in fact, that he did not move out after his divorce. As part of the settlement, he kept the lowest floor of the triplex, while his wife retained the upper two levels and converted them to a duplex for her own use. To provide for his second wife, Margaretta Fitler (‘Happy’) Murphy, and her children, Rockefeller expanded his one floor at 810 by connecting it to a full floor he purchased in the newly constructed building at 812 next door. Because of floor-level differences, a half-flight of steps was needed between the two sections of the sprawling 12,000-square-foot complex....Sensitive to his first wife, Rockefeller and his second wife planned their new home so that they could use the 812 Fifth Avenue entrance, thereby avoiding the possibility of chance encounters in the elevator of Number 810." Nelson Rockefeller, of course, was the Governor of New York State and in 1963 former Vice President Richard Nixon purchased the fifth-floor apartment at 810 Fifth Avenue, taking possession not long after Happy and Nelson Rockefeller had moved into their new home. The two would become major rivals in the Republican Party and Nixon would eventually move out of the building. Needless to say, any building good enough for Nelson Rockefeller, a major art collector as well as politician, is good enough for most people and this building has fabulous Central Park views. It has a doorman and a concierge, but no garage and no balconies.